There is something great about watching a character who doesn’t care about the opinions of those around them, who has lost almost everything and who is given seemingly free-reign to say and do whatever they wish. That joy is brought to life by Frances McDormand in Three Billboards and effectively adds a layer of dark humour through a drama which could have been played straight and still been just as effective. McDormand is given one of the best roles of her career here. She is a woman at the end of her tether, frustrated with the lack of progress that the local law enforcement have made in her daughter’s attack and murder, and takes drastic action. You are on her side in the beginning but like any good movie, hers is a character with shades of grey and as the film progresses your allegiances, or at least your perception of who is “right” and “wrong,” may shift. That is down to excellent support that McDormand has around her. On the other side of this legal coin is Woody Harrelson’s Sheriff who struggles with the accusations that three well-placed billboards aim squarely at his door. He also struggles to contain the unruly and off-the-chain Dixon who has a more brutal approach to law-enforcement. It is Dixon’s story that impresses and interests the most, with Sam Rockwell giving an excellent performance (one deemed Oscar worthy, as was McDormand’s). It again adds to that “grey-area” approach to characters and his is a character you may detest at the beginning but find yourself rooting for as events unfold. They events themselves are satisfyingly unpredictable. Nothing too far-fetched but Three Billboards is certainly a film you’d struggle to predict. Moments shock and set-pieces have the desired impact. The film will keep you rooted to edge of your seat at times but without ever really approaching “action” in the traditional sense. Good writing proves to be just as compelling, particularly when you have this cast delivering the razor sharp wit and bullet-like lines. 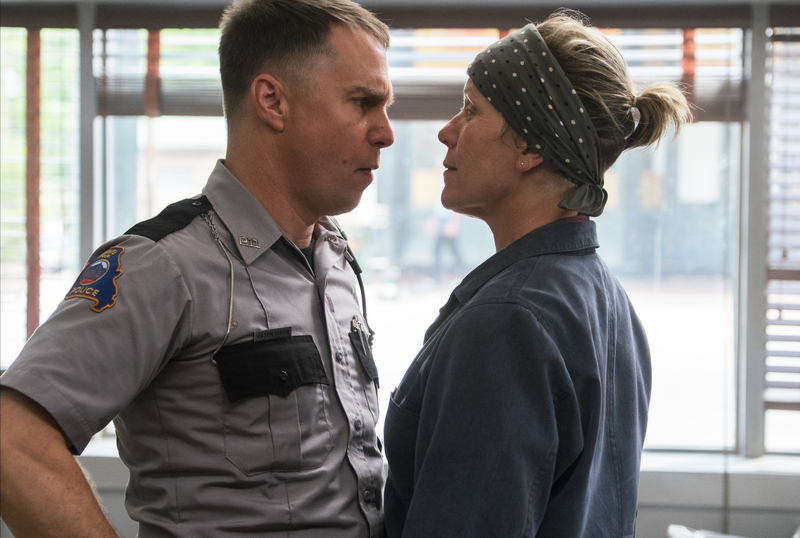 You could argue that the whole film is balanced on a flimsy, almost “stunt” premise but the simplicity of the Three Billboards of the title is a story-element that continues to pay-off. They almost become a character themselves and you are as invested in their fate and their impact as you are of the principle characters in the story. A story, which annoyingly for some, ends fairly ambiguously. 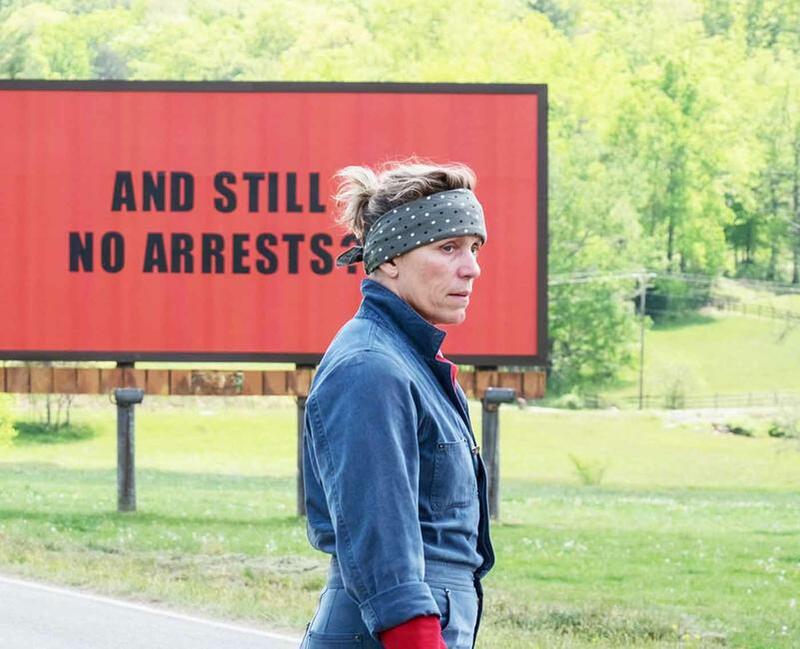 Some may see Three Billboards as the middle act in a story, with the set-up and satisfying pay-off left for the audience to imagine. That could be aimed as a criticism but there is enough in Three Billboards that does pay-off for the ambiguous ending to actually play into the movie’s appeal rather than dampen it. 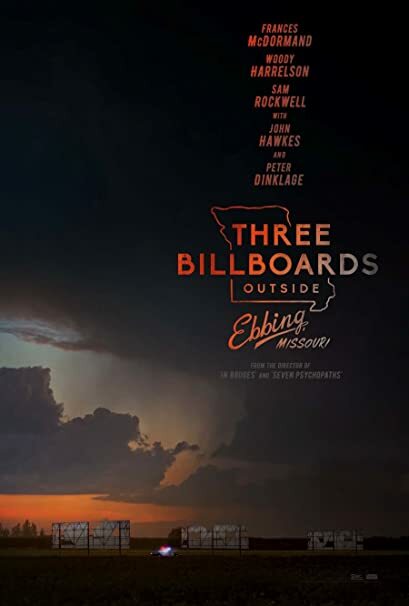 Overall, Three Billboards is a well-written, excellently acted and compelling story which has a unique hook to hang the events upon. The story is unpredictable but never less than gripping, with a black humour that only adds to the drama which unfolds. A modern classic.